Separation Anxiety is a microgame found in the Total Drag stage in WarioWare: Touched! and returns in WarioWare Gold as one of Orbulon's microgames. It gets its name from separation anxiety disorder. 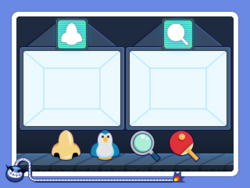 The objective of the game is to drag and sort the objects at the bottom to their proper locations at the top of the screen. Because of the extra thinking needed, this game lasts twice as long than most of the others in the game. 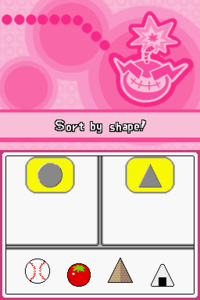 1st level difficulty: Four objects must be sorted by shape. 2nd level difficulty: Four objects must be sorted by clothes or hairstyle. 3rd level difficulty: Five objects must be sorted by clothes or hairstyle. This page was last edited on January 17, 2019, at 15:14.